Title: 12/01/1988 - Hazard determination criteria for corrosive liquids. This is in response to your letter of September 7, regarding the hazard determination requirements under the Occupational Safety and Health Administration's (OSHA) Hazard Communication Standard 29 CFR 1910.1200. Please accept by apology for the delay in response. Question 1: If a company chooses not to have their products tested by this method (as stated by 29 CFR 1910.1200), what criteria would determine if a product is classified as corrosive on hazard warning labels and MSDS sheets? Answer: As a chemical manufacturer, importer or employer evaluating chemicals, you are not required to follow any specific test methods stated in 29 CFR 1910.1200 for the hazard determination. You must, however, be able to demonstrate that the hazards of the chemicals produced or imported have been adequately ascertained in accordance with the criteria set forth in Appendix B, Hazard Determination found in 29 CFR 1910.1200. 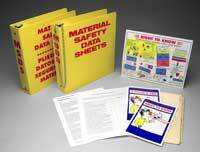 In making the hazard determination you are not required to perform chemical testing. The evaluation is to be based on currently available information. You are required to consider all available scientific evidence concerning the hazard of a chemical in addition to consulting the floor reference sources, listed in paragraph (d)(3) of the standard. These are 29 CFR Part 1910, Subpart Z, Toxic and Hazardous Substances, OSHA; and Threshold Limit Values for Chemical Substances and Physical Agents in the Work Environment, ACGIH. Additional information sources to evaluate the hazards associated with the chemicals are listed in Appendix C to 29 CFR 1910.1200. Question 2: Would pH measurements define corrosivity of that product or would there be other test methods? Answer: The pH is a measure of the acidity or alkalinity of a solution. Although pH is a characteristic of a corrosive liquid, it would not define corrosivity, as a corrosive material can be liquid or solid. Titanium tetrachloride is an example of a solid corrosive material [ILPI says: that statement is incorrect, TiCl4 is a liquid. Tungsten hexachloride, WCl6 would be a solid example.] To make a thorough and defensible hazard determination, not only pH but all relevant data available must be examined. Question 3: Should other labels such as "CAUTION IRRITANT" be used in place of "CORROSIVE?" Answer: An irritant is a chemical, which is not corrosive, but which causes a reversible inflammatory effect on living tissue by chemical action at the site of contact. If the evidence available on a chemical indicates it is an irritant hazard rather than corrosive, the appropriate hazard warning must be used. The hazard warning must convey the hazard of the chemical and the target organ effects, when such information is available (i.e., eye irritant or skin irritant).